Thermoplastic coated small hole # 11 ga. punched steel forms the top and seats on this uniquely designed octagon outdoor picnic table. Easy access 2-7/8" O.D. 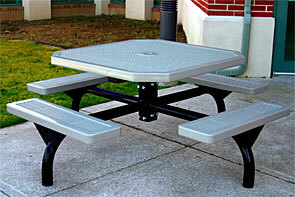 powder-coated frames add strength and durability to this attractive yet functional picnic table. The in-ground models have an extra 30"Length on the frame legs to allow for permanent installations. The other models have standard mounting plates that can be either bolted down to concrete/asphalt for surface mounting applications or left un-bolted for portable applications. 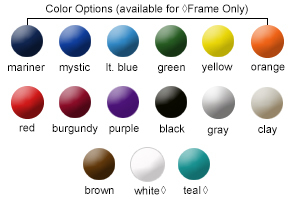 Table top and seats can be finished with a lightly textured matte Polyethylene in the color options shown below.